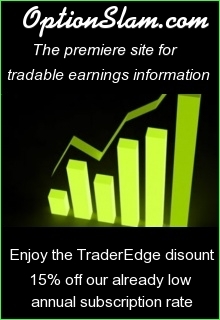 Ownership and Operating Authority: TraderEdge.NET is owned and operated solely by Trading Insights, LLC. 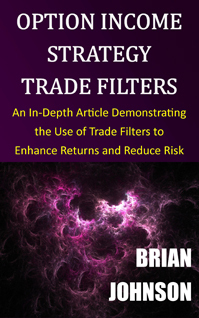 Brian Johnson, as the primary author and editor of posts on TraderEdge.NET, is functioning exclusively under the authority of, and as a member of Trading Insights, LLC, not as an individual. Limitation of Liability: UNDER NO CIRCUMSTANCES, INCLUDING BUT NOT LIMITED TO NEGLIGENCE, SHALL BRIAN JOHNSON AND/OR TRADING INSIGHTS, LLC BE LIABLE TO YOU FOR DIRECT, INDIRECT, INCIDENTAL, CONSEQUENTIAL, SPECIAL, PUNITIVE OR EXEMPLARY DAMAGES EVEN IF BRIAN JOHNSON OR AN AUTHORIZED REPRESENTATIVE OF TRADING INSIGHTS, LLC HAS BEEN ADVISED SPECIFICALLY OF THE POSSIBILITY OF SUCH DAMAGES, ARISING FROM USE OF OR INABILITY TO USE THE INFORMATION, SERVICES, SPREADSHEETS, SOFTWARE, PRODUCTS, OR SUBSCRIPTIONS ON THIS SITE, SUCH AS, BUT NOT LIMITED TO, LOSS OF REVENUE OR ANTICIPATED PROFITS OR LOST BUSINESS. Applicable law may not allow the limitation or exclusion of liability or incidental or consequential damages. In no event shall Brian Johnson's and Trading Insights, LLC's total liability to you for all damages, losses, fees, costs, expenses, and causes of action (whether in contract or tort, including but not limited to negligence) exceed the annual amount paid by you, if any, for accessing this site. Indemnification: As a user of this site and/or of any products, services, software, spreadsheets, or subscriptions offered herein, you agree, at your own expense, to indemnify, defend, and hold harmless Brian Johnson and Trading Insights, LLC, and its representatives, employees, owners, suppliers, and agents, against any claim, suit, action or other proceeding brought against Brian Johnson, Trading Insights, LLC, its representatives, employees, owners, suppliers, and/or agents based on or arising in connection with your use of this site or any of the products, services, spreadsheets, software, or subscriptions offered herein. You agree to pay any and all costs, damages, and expenses, including, but not limited to reasonable attorneys' fees and costs awarded against or otherwise incurred by, or in connection with, or arising from any such claim, suit, action or proceeding attributable to any such claim. Not a Registered Investment Adviser: Brian Johnson and Trading Insights, LLC are not registered as investment advisers with the SEC or with any state securities agency. Instead, Brian Johnson and Trading Insights, LLC rely on the "publisher's exclusion" from the definition of "investment adviser" as provided under Section 202(a)(11) of the Investment Adviser Act of 1940 and corresponding state securities laws. The site content and products, software, spreadsheets, subscriptions, and services offered thereon are general and regular publications offering wide-ranging investment-related information to users and are not tailored to the specific investment needs of any individual user. Investment information is provided without consideration of the financial sophistication, financial situation, investment horizon, or risk tolerance of individual users of this site. All users are expected to consult with their own independent financial advisers and perform their own due diligence research before making any trade or investment decisions. Information and Opinions: Information on this site is provided solely for informational or general educational purposes and should not be construed as an offer to sell or the solicitation of an offer to buy securities or to provide investment advice. The opinions and analysis included herein are based on sources believed to be reliable, but no representation or warranty, express or implied is made as to their accuracy, completeness, timeliness, or correctness. All investment information contained herein should be verified independently. Brian Johnson may have long or short positions in the securities discussed on this site. He may buy or sell the securities discussed for purposes of investment or trading without disclosing such trades to users of this site. Results: Past performance is not necessarily indicative of future results. Investment information may not be appropriate for all investors. NO REPRESENTATION IS BEING MADE THAT ANY ACCOUNT WILL, OR IS LIKELY TO ACHIEVE PROFITS OR LOSSES SIMILAR TO THOSE DISCUSSED WITHIN THIS SITE. IF YOU DECIDE TO INVEST REAL MONEY, ALL TRADING DECISIONS SHOULD BE YOUR OWN. U.S. Government Required Disclaimer - Commodity Futures Trading Commission states: Futures and Options trading has large potential rewards, but also large potential risk. You must be aware of the risks and be willing to accept them in order to invest in the futures and options markets. Don't trade with money you can't afford to lose. This is neither a solicitation nor an offer to Buy/Sell futures, stocks or options. No representation is being made that any account will or is likely to achieve profits or losses similar to those discussed in this document. The past performance of any trading system or methodology is not necessarily indicative of future results. Risk: The risk of loss in the trading of stocks, ETFs, options, futures, FOREX, foreign equities, and bonds can be substantial. Strategies discussed on this site should be considered speculative and contain a high degree of volatility and risk. Options are not suitable for all investors. 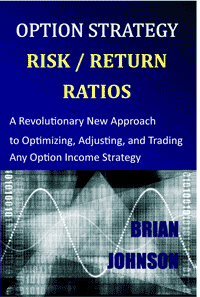 For more information read the "Characteristics and Risks of Standardized Options." For a copy, call 1-888-OPTIONS, or contact the Options Clearing Corporation, One North Wacker Drive, Suite 500, Chicago, Illinois 60606. Advertising: The appearance of advertisements on this site in no way constitutes an endorsement of the products advertised. Neither Brian Johnson nor Trading Insights, LLC approves of or endorses any of the products or services that appear in advertisements on this website. Third Party Affiliate Vendors: Brian Johnson and Trading Insights, LLC may mention the products or services of third party affiliate vendors on this site. If Brian Johnson and/or Trading Insights, LLC are compensated directly by such third party vendors, this relationship will be disclosed on this site. Even if specific products or services are mentioned, that does not constitute an endorsement of these products or services. It is your responsibility to evaluate the suitability and credibility of such products and services. 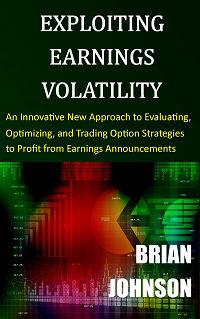 Proprietary Information: Brian Johnson has developed and programmed numerous proprietary indicators, models, strategies, algorithms, and filters with custom parameters. Occasionally, some of these tools may be discussed in general terms or displayed graphically on this site. However, source code, formulas, and specific parameter values will not be disclosed. In addition, access to these proprietary tools will not be provided on a regular basis, unless offered as premium content. Copyright: This site contains proprietary and original information that is owned by Trading Insights, LLC - All Rights Reserved. However, you may share links to public sections of this site via email, social networks, and other electronic channels - and you are encouraged to do so. Confidentiality - Premium Content: Some information on this site may be provided exclusively to e-subscribers who pay a fee for such content and are provided a unique password to access this material. In that event, you may print a copy of the premium content for your own use only, but you may not reproduce or distribute the premium material verbally, electronically, or in writing to any individual, entity, or organization. In addition, you may not substantially copy the premium information electronically, or provide your password to others. Subscribers also agree not to attempt to reverse-engineer any premium content, formulas, algorithms, or other proprietary information on this site. Violation of these terms will void your subscription and terminate your right to access any premium content on the site. If any user distributes premium content, reverse-engineered content, passwords, signals, scores, spreadsheets, or any other premium content, the user will be liable to Trading Insights, LLC for damages in the amount of the lost subscription revenue for all subsequent users of such proprietary material for every month of use, plus punitive damages, plus the cost of recovering such damages. E-Subscription Fees: Separate subscriptions will be offered to professionals and non-professionals. All subscription fees are payable in advance. Professionals shall include banks, hedge funds, insurance companies, registered investment advisers, CTAs, mutual funds, endowments, pension plans, LLCs, corporations, and any other entity or individual engaged in the management of investments in exchange for compensation. Subscriptions may be canceled at any time through the subscribers PayPal account, but all subscription fees are non-refundable. Trading Insights, LLC may terminate subscriptions at any time, at its sole discretion. 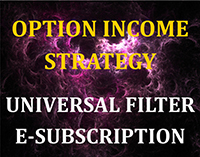 OISUF E-Subscription Deliverable: Purchasers of an OISUF E-Subscription will be entitled to download the OIS Universal Filter spreadsheet and use the spreadsheet algorithms only during the paid term of their subscriptions. Access to the spreadsheet and passwords will begin upon: payment of the subscription fee (described above) to Trading Insights, LLC AND completion of the registration process (including acceptance of the disclaimer and terms). Subscribers are solely responsible for applying the OISUF algorithm results to their own option trading strategies. New spreadsheet passwords will be provided in the restricted area of the site monthly. Only current subscribers will be allowed access to the restricted area of the site. 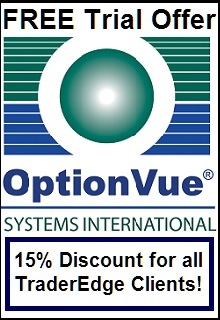 OISUF subscribers are not entitled to the OISUF strategy algorithms, filters, software code, parameters, or any other proprietary OISUF algorithm information. Trading Insights LLC will attempt to deliver monthly passwords (prior to the opening at the beginning of the month) and provide access to the site, but cannot guarantee that all updates will be delivered on a timely basis. Updates will be posted in a restricted subscriber's area of www.TraderEdge.Net and/or sent via email. The method of delivery will be at the sole discretion of Trading Insights, LLC. It is the subscriber's responsibility to ensure the email address entered during registration is current and accurate and that their email settings allow receipt of email messages from BJohnson@TraderEdge.Net. Trading Insights, LLC may terminate e-subscriptions at any time, at its sole discretion. AAR E-Subscription Deliverable: Purchasers of an AAR E-Subscription will be entitled to receive AAR monthly strategy signals and AAR monthly security scores for the five investment candidates during the paid term of their subscription. Access to the AAR strategy signals will begin upon: payment of the subscription fee (described above) to Trading Insights, LLC AND completion of the registration process (including acceptance of the disclaimer and terms). Subscribers are solely responsible for the management of their positions and orders, including stop orders. Trading Insights LLC will NOT notify AAR subscribers when strategy stop-loss events occur or when adjustments are required to stop prices due to dividends or futures roll transactions. AAR subscribers are not entitled to the AAR strategy algorithms, filters, software code, parameters, or any other proprietary AAR strategy information. Trading Insights LLC will attempt to deliver AAR strategy updates on a timely basis (prior to the opening at the beginning of the month), but cannot guarantee that all updates will be delivered on a timely basis. Updates will be posted in a restricted subscriber's area of www.TraderEdge.Net and/or sent via email. The method of delivery will be at the sole discretion of Trading Insights, LLC. It is the subscriber's responsibility to ensure the email address entered during registration is current and accurate and that their email settings allow receipt of email messages from BJohnson@TraderEdge.Net. Trading Insights, LLC may terminate subscriptions at any time, at its sole discretion. Legal: In the event of disagreements between the parties, all parties agree to submit to binding arbitration. This agreement shall be governed in accordance with the laws of the State of North Carolina and the parties agree that the jurisdiction and sole venue to resolve any disagreements shall be in Orange, Durham, Wake, or Chatham County, North Carolina. The intellectual property rights, limitation of liability, indemnification, and confidentiality provisions shall survive expiration, cancellation, or termination of subscriptions, services, product offerings, or agreements by either party.